Who says you need elaborate camera gear to take professional, high-quality video? With this iOgrapher bundle, all your need is your original full-sized iPad 2, 3 or 4 to create a truly powerful filmmaking device. No more shaky, low-quality videos! The iOgrapher case will help you steady your video plus give you the flexibility to add all the attachments you need to shoot your best videos. Far smaller and more lightweight than traditional filming gear, you can easily carry it around with you on a day of filming. It’s perfect for shooting both with and without the tripod. Is the iPad camera lens not wide enough to cover the shot you want? Use the iOgrapher wide angle lens to create the wide shot of your dreams! Do you need to get your shot closer to the action? The 2X telephoto lens will get you there! The iOgrapher Multi use Tripod is great for creating your video content! When compacted its a mere 26 inches long, but extend its full height and it can go to 67 inches! RODE Video Mic Go is a super lightweight shotgun mic perfect for getting great audio. The SC7 is a high-quality shielded patch cable, designed to allow the VideoMic GO to connect to TRRS compatible devices such as the iPhone or iPad. The gold-plated contacts are color coded, with grey indicating the TRRS output. 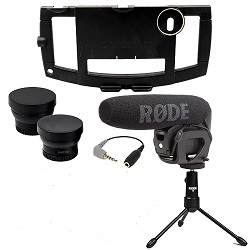 The cable is color matched to the red TRS to TRS cable that is supplied with the VideoMic GO, and is easily fitted by inserting the TRS (black) jack into the rear of the VideoMic GO and the TRRS end (grey) into the smartphone or tablet. The SC6 is an input/output breakout box for smart phones and tablets. With two TRRS inputs and one stereo headphone output, the unit connects to any TRRS device and allows the use of one or two smartLav microphones as well as headphones for monitoring and playback. With the SC6 users can monitor audio from the smartLav, as well as input two smartLavs into the one mono channel in interview or dual-dialogue scenarios. Please Note: This item will be shipped to you direct from the manufacturer which may result in extended delivery times of 7-10 days.